The Ocean City Nor'easters are excited to announce the clubs's Spring Outdoor Recreation Soccer Program. The program will begin Saturday, April 27 and run through June 8 and are open to players up to 8th grade. The camps will take place on Saturdays and will be taught by members of the Ocean City Nor'easters' coaching staff, and assisted by players from the Nor'easters' USL League Two team once they arrive in May. The Ocean City Nor'easters are excited to announce that registration is open for the club's 15th annual Summer Vacation Soccer Camps. Kids from ages 3 - 14 are invited to learn to play the game of soccer in a fun environment throughout the summer. For the convenience of our families, the camps will take place in one-week sessions. 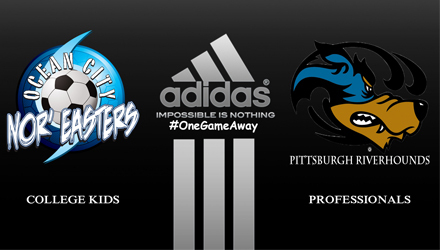 The Ocean City Nor'easters are proud to announce four additional home games to the club's 2019 schedule. 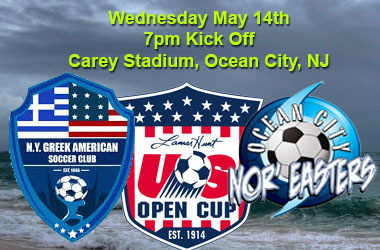 The Nor'easters will take a break from their USL League Two schedule to play all four of these exhibition games in front of their home fans at Carey Stadium (aka: The Beach House) in Ocean City, N.J.
One of the most anticipated matchups of the four will feature the first-ever meeting between the Nor'easters and second-year National Premier Soccer League (NPSL) club Atlantic City FC. The Ocean City Nor'easters, one of the top USL League Two (formerly Premier Development League) soccer clubs in North America, are building a championship team for the 2019 season and are looking for a few more good men. 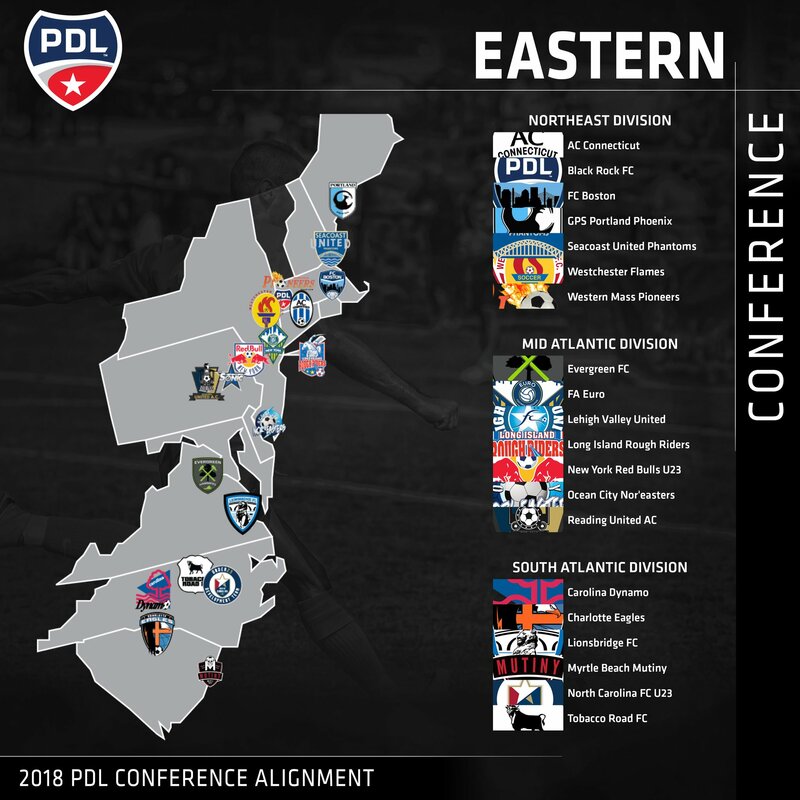 The USL League Two (formerly the Premier Development League) released the league schedule and alignment for the 2019 season on Thursday. The league will feature 72 teams across North America split into four conferences with all teams playing a 14-game schedule. Registration now open for program that kicks off March 9 in Ocean City, N.J. The Ocean City Nor'easters are excited to bring back the clubs's Spring Indoor Soccer Recreation Program. The five-session program will kick off on March 9 and runs through April 13 and is focusing on helping the youngest players begin their love for the game of soccer. The Spring Indoor Soccer Rec Program is open to all pre-K kids as they will be provided with a fun introduction to the game. With 2018 drawing to a close, it's time to take a look at how all of our former Ocean City Nor'easters are currently performing at the professional level (in alphabetical order). The Ocean City Nor'easters, one of the top USL League Two (formerly Premier Development League) soccer clubs in North America, are building a championship team for the 2019 season and are looking for a few good men. The Nor'easters will host a pair of open tryout sessions on on Saturday, Dec. 22 and Saturday, January 5 at Carey Stadium ("The Beach House") in Ocean City, N.J. Both events will begin at 11 a.m.
On a historic day for the evolution of soccer in North America, the United Soccer League has unveiled a new structure and brand identity for each of its top three leagues ahead of the 2019 season. The Ocean City Nor'easters are excited to announce the club's head coach for the 2019 Premier Development League (PDL) team. Tim Oswald, the Nor'easters' sporting director for the last two seasons, and the club's head coach from 2012-16, will return to the sidelines for the 2019 season. Oswald, Ocean City's all-time leader in PDL coaching wins, takes over for John Thompson who recently stepped down after back-to-back nine-win seasons and leading the Nor'easters to the Third Round of the Lamar Hunt US Open Cup. This year's edition, which is open to all players from Pre-K up to 8th grade will kick off on Sept. 8 and run through Oct. 27. The recreation program will provide kids with a fun, age-appropriate introduction to the game of soccer from top-level coaches from the Ocean City Nor'easters organization. After two successful seasons in charge of the Ocean City Nor'easters, head coach John Thompson is stepping down. The Ocean City Nor'easters finished the club's 22nd season in the Premier Development League (PDL) with another successful campaign. For the fourth time in club history, they advanced to the Third Round of the Lamar Hunt US Open Cup and won nine of the club's 14 league games. The Ocean City Nor'easters have announced the club's team awards for the 2018 Premier Development League (PDL) season. The Nor'easters finished their 22nd season in club history (16th in the PDL) with a 9-5-0 league record and advanced to the Third Round of the 2018 Lamar Hunt US Open Cup. 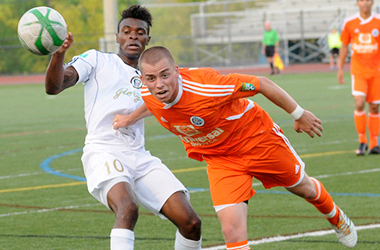 A nine-win league season is expected to earn qualification for next year's US Open Cup. The final game in the 2018 Premier Development League (PDL) season for the Ocean City Nor’easters kicked off Sunday night against the playoff-bound New York Red Bulls Under-23s at the Carey Stadium ("The Beach House"). Deri Corfe (Wright State / Chester, England) and Alex Rose (North Carolina / Cary, NC) each scored first half goals to give Ocean City a 2-1 win. The Ocean City Nor'easters hosted the D.C. United Under-23s in an exhibition game on Friday night at Carey Stadium. The goal was to build some confidence heading into Sunday's Premier Development League (PDL) season finale against the New York Red Bulls Under-23s. The Nor'easters scored five goals in the opening 32 minutes of the game and never looked back as they defeated D.C. United, 7-1. For the third year in a row, the Ocean City Nor'easters will welcome the D.C. United Under-23s for an exhibition game at Carey Stadium. The two teams will square off on Friday, July 13, two days before the Nor'easters are scheduled to host a high-stakes Premier Development League (PDL) season finale against the New York Red Bulls Under-23s at the Beach House. Kickoff for the match is scheduled for 6 p.m. The Ocean City Nor'easters' playoff hopes may be out of reach, but with a 3-2 win over Lehigh Valley United on Wednesday night, their goal of qualifying for the 2019 Lamar Hunt US Open Cup is alive and well. Alex Rose (North Carolina / Cary, NC) scored his team-leading seventh goal of the season, while Max Hemmings (Georgia State / Wokingham, England) and Finn Reese (Nyack College / Hamburg, Germany) added a goal each to lead the way. Nor'easters goalkeeper Todd Morton (Delaware / West Chester, PA) made seven saves to pick up his team-leading fifth win of the season. The Ocean City Nor'easters' Premier Development League (PDL) playoff hopes took a major blow on Saturday night with a 4-2 loss to rivals Reading United AC. At Carey Stadium, Fredlin "Fredinho" Mompremier (Fairleigh Dickinson / Limbe, Haiti) and Deri Corfe (Wright State / Chester, England) each scored for Ocean City but the undefeated Reading side was just too much as they clinch the Mid-Atlantic Division title for the second time in the last three years. There are just three games (and one friendly) remaining for the Ocean City Nor'easters in the 2018 Premier Development League regular season. 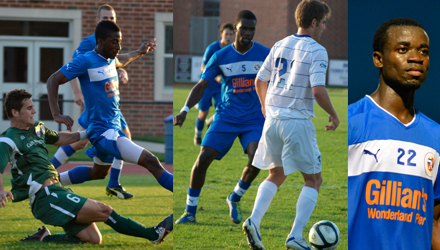 If Ocean City wants to have a chance at qualifying for the PDL playoffs, they will have to win all three. Luckily for the Storm, all three of those games are being played at home, and the biggest challenge of their remaining games arrives in Ocean City on Saturday as the Nor'easters will host long-time rivals Reading United AC. 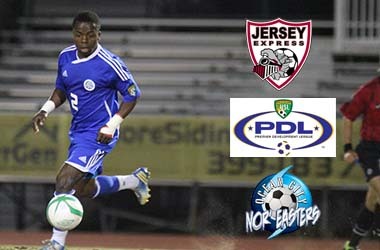 Ocean City Nor'easters forward Fredlin "Fredinho" Mompremier (Fairleigh Dickinson / Limbe, Haiti) was voted the winner of Week 9's Premier Development League Goal of the Week. Mompremier received 48% of the voting to win the award. UPDATE: The D.C. United Under-23s match has been moved to a 6 p.m. kickoff time. For the third year in a row, the Ocean City Nor'easters will welcome a pair of high-level opponents for exhibition games at Carey Stadium. On Monday, July 2, West Chester United, a club that fields teams in the National Premier Soccer League (NPSL) and the Northeast Soccer League (NESL), will arrive in Ocean City to take on the Nor'easters. United will bring a Under-23 team to take on the Nor'easters' Under-23s for a 3:30 p.m. kick with the main event taking place at 7 p.m.
One of the oldest rivalries in the Premier Development League (PDL) will add another chapter on Wednesday night when the Ocean City Nor'easters host Reading United AC. The Ocean City Nor’easters played on the road this past Saturday night, traveling to take on the division leaders, Reading United. This game marked the 46th match in a 20-year history between the two clubs. Ocean City (4-3-0) still clings to the all-time series lead at 20-19-7. The Ocean City Nor'easters defeated Lehigh Valley United 4-1 to earn the club's third straight Premier Development League (PDL) win. Abdul Mansaray (Wilmington / London, England) led the way by creating three first half goals (two goals, one assist) as Ocean City won the first leg of a tough stretch where the Nor'easters have two road games in Eastern Pennsylvania in a three-day span. The Ocean City Nor'easters got back to their winning ways with a 2-0 win over the Long Island Rough Riders on Sunday night at Carey Stadium. It was the third year in a row that the Nor'easters have won their home opener as the Storm extended their home unbeaten streak at The Beach House to 10 games. The Ocean City Nor'easters had their 2018 Lamar Hunt US Open Cup run come to an end Tuesday night, falling 4-1 on the road against North Carolina FC. The pro team from the United Soccer League jumped out to an early lead only to see the Nor'easters equalize with a goal from Ocean City defender Uros Ilic (Missouri Valley College / Nova Pazova, Serbia). NCFC would re-take the lead about 10 minutes later and would add two more in the second half to put the game away. The Ocean City Nor'easters have had a tremendous start to the 2018 season. While they only have three games under their collective belt, they have won all three, including the Premier Development League (PDL) opener against FA Euro, and two wins in the Lamar Hunt US Open Cup, including last Wednesday's stunning upset of the Charlotte Independence, a professional team in the United Soccer League. The Ocean City Nor'easters have advanced to the Third Round of the Lamar Hunt US Open Cup after upsetting the Charlotte Independence of the United Soccer League (USL), 3-1. This is the sixth time in club history that Ocean City has defeated a pro team in US Open Cup play, but this marks the first time that the Nor'easters have upset a pro team on the road. The Ocean City Nor'easters continue their run in the 2018 Lamar Hunt US Open Cup on Wednesday night when the club heads down to North Carolina for a Second Round matchup with a professional team. 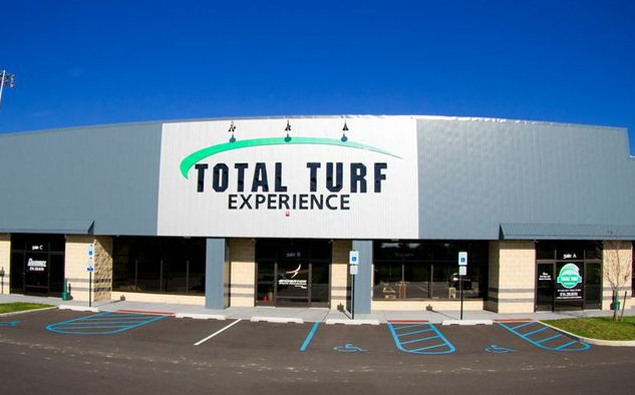 Ocean City will face the Charlotte Independence of the United Soccer League (the league directly below Major League Soccer) at the Mecklenburg County Sportsplex in Matthews, NC. The Ocean City Nor'easters kicked off the 2018 Premier Development League with a win for the third year in a row on Sunday night. The Nor'easters came from behind to defeat FA Euro New York, 2-1 at the Aviator Sports Complex in Brooklyn, NY. The Ocean City Nor'easters kick off the 2018 Premier Development League season on the road this weekend. It will be Ocean City's 22nd season, and the club's 16th in the PDL. 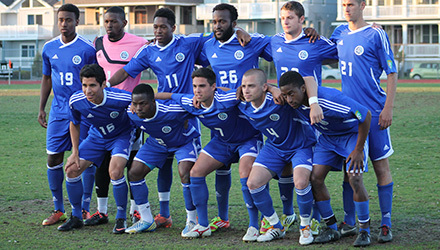 The Nor'easters will travel to Brooklyn on Sunday, May 13 to take on FA Euro New York at the Aviator Sports Complex. The Ocean City Nor'easters advanced to the Second Round of the 2018 Lamar Hunt US Open Cup with a 3-0 road win over AFC Ann Arbor. 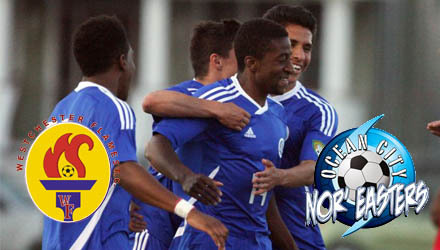 The Nor'easters had to make the long trip to Southeast Michigan for their opening round game and they received goals from Williams N'Dah (Charleston / Rome, Italy), Simone Raioli (Grand View / Triuggo, Italy) and last year's leading scorer Fredinho Mompremier (Fairleigh Dickinson / Limbe, Haiti). 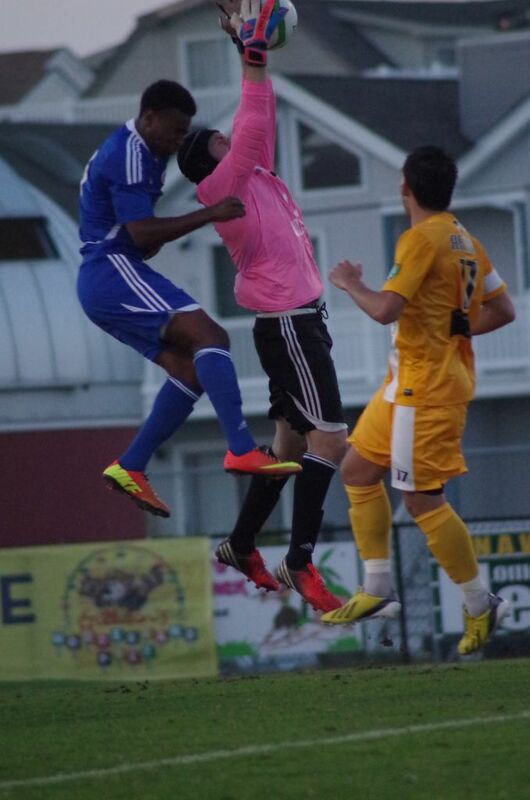 Alec Smir (North Carolina / Greensboro, NC) made seven saves to earn a clean sheet in his Nor'easters debut. The Ocean City Nor'easters are departing today for Southeast Michigan to take part in the Lamar Hunt US Open Cup for the ninth time in franchise history. The Nor'easters will face off with AFC Ann Arbor of the National Premier Soccer League (NPSL) in the First Round of the 105th edition of the oldest cup competition in the United States. The Ocean City Nor'easters are entering the club's 22nd season (16th in the PDL) and are pleased to announce the roster for the upcoming 2018 Premier Development League (PDL) season. The first of two installments of the roster announcement will focus on the defense which features a variety of international players, but only two of them returning from last year's team. 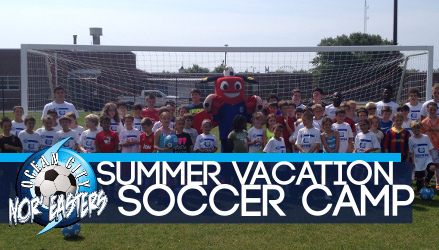 The Ocean City Nor'easters are excited to announce that registration is open for the club's 14th annual Summer Vacation Soccer Camps. Kids from ages 3 - 14 are invited to learn to play the game of soccer in a fun environment throughout the summer. Winning a sports championship is every athlete’s dream. Most chase this dream but few are able to see it become a reality. 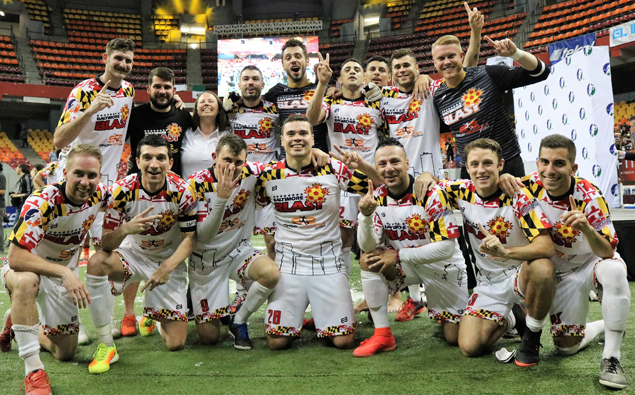 For Baltimore Blast midfielder Tony Donatelli has been fortunate to win eight professional championships, both indoor and outdoor, and he just won his fourth Major Arena Soccer League (MASL) title with the Blast. In fact, since 1995, no one has won more professional indoor soccer championships than Donatelli. The Glenside, Pa. native is one of seven players who has won five career titles. 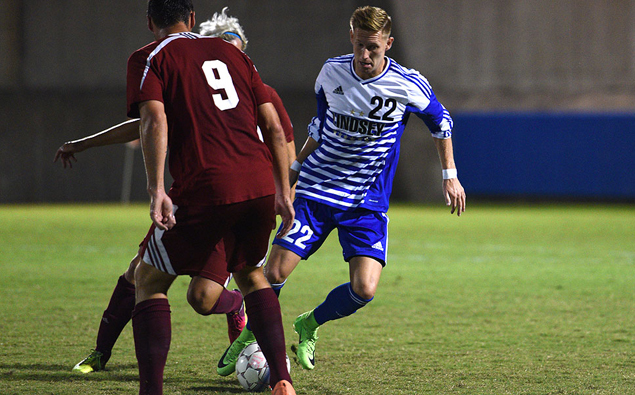 Tyler Collishaw has traveled thousands of miles in his quest to become a full-time professional soccer player. This quest has taken the Hull, England native to clubs like Leeds United, Bristol City and his hometown Hull City before moving stateside where he was an All-American at Davenport University in Michigan and spent last summer on the Jersey Shore with the Ocean City Nor’easters. After a great 2017 season for the Nor’easters last summer, most of the players returned back to school to play for their respective collegiate teams. The 2017 Premier Development League (PDL) season is nearly over with the league championship game scheduled for this weekend. Despite finishing with one point more than last year's Eastern Conference championship team, the Ocean City Nor'easters missed out on the playoffs this year, but likely did enough to qualify for the 2018 Lamar Hunt U.S. Open Cup. With most of the Nor’easters headed home or heading back to their respective colleges, it’s time to hand out the 2017 team awards to reflect so many of the outstanding individual performances. The Ocean City Nor'easters capped off the 2017 PDL campaign in style with a 5-0 win over Lehigh Valley United at Carey Stadium on Wednesday night. Five goals was a season high for the Nor'easters who avenge a loss to Lehigh Valley from earlier in the season It was a stellar performance from the forwards as Ismael Noumansana (Lenoir-Rhyne / Bamako, Mali) scored twice and Fredlin "Fredinho" Mompremier (Fairleigh Dickinson / Limbe, Haiti) added one goal and two assists to end the season on a positive note. The Ocean City Nor'easters claimed a win on Friday night at "The Beach House" in a friendly match against the New England Revolution Under-23 team. Birthday boy, Akeil Barrett (Tulsa / Kingston, Jamaica) scored from the penalty spot and added an assist in a 2-0 win over the MLS Academy side. The Ocean City Nor'easters grabbed all three points in a crucial 1-0 win at home against their oldest rival Reading United AC. 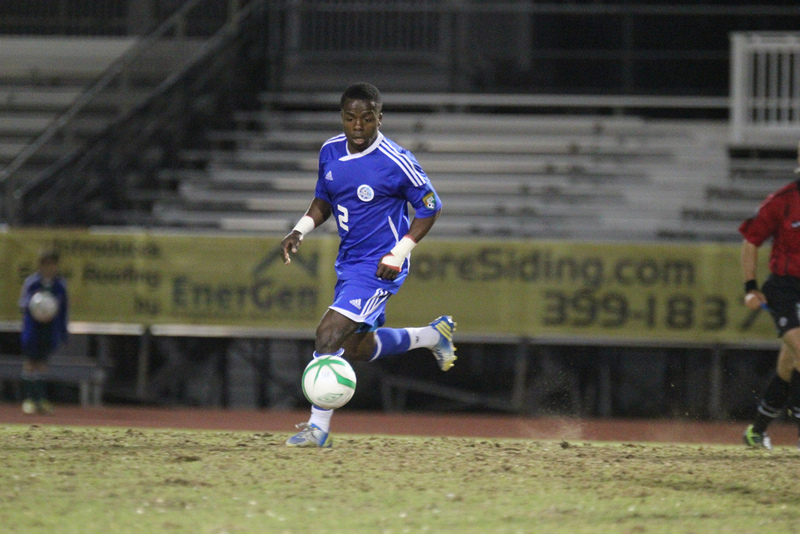 Fredlin "Fredinho" Mompremier (Limbe, Haiti / Fairleigh Dickinson) scored a first half penalty kick which proved to be the difference in the 45th all-time meeting between the two clubs. This coming week features two of the biggest games of the 2017 PDL season for the Ocean City Nor'easters and one of them is undergoing a schedule change. Saturday's home match at Carey Stadium against Reading United AC is being moved to the following day. The game will now kick off on Sunday, July 2 at 7 p.m.
Game will be replayed on Thursday, June 29th at 7:30 p.m. in Reading, Pa. The next few league games are extremely important for the Ocean City Nor’easters, and it starts on Friday night when they visit long-time rival Reading United AC in the final regular season road game of the season. The game will be played at Don Thomas Stadium in Reading, Pa., with kickoff scheduled for 7:30 p.m. 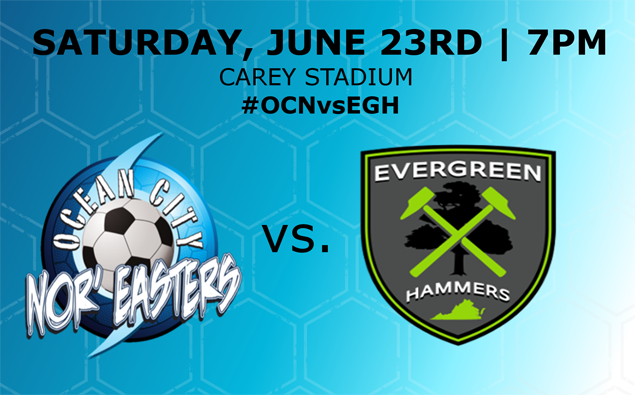 Ocean City Nor’easters will go on the road this Saturday to play Evergreen FC and complete the season series between the two teams. The Ocean City Nor'easters made it three wins in three PDL matches to start the season with a 1-0 road win at FA Euro New York. This is the club's first 3-0-0 start since the 2013 season, the year they reached the PDL National Semifinals. 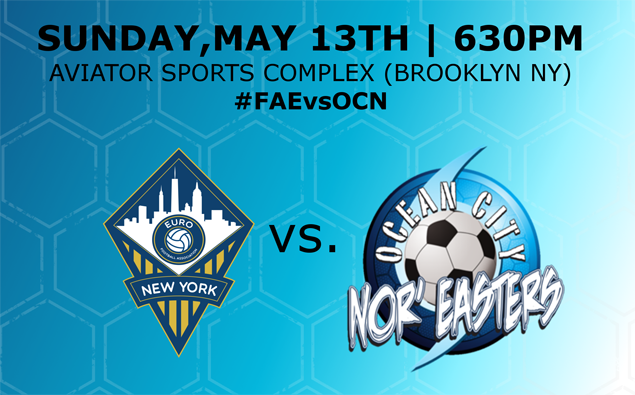 The Ocean City Nor’easters will play the club's first road game of the 2017 Premier Development League season tonight when they head to New York City to take on FA Euro. Ocean City enters the game tied for first place in the Mid-Atlantic Division with a 2-0-0 record and this will be the first of four straight road games for the club. The Ocean City Nor’easters completed their Premier Development League (PDL) opening weekend with a sweep of the Evergreen Hammers FC in the opener of the PDL season. Register today for Nor'easters Summer Vacation Camp! 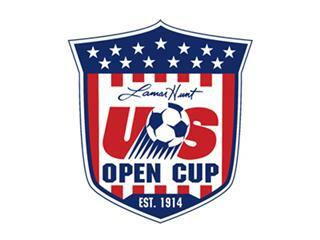 The Lamar Hunt US Open Cup made its way back to Ocean City Wednesday night as the Ocean City Nor’easters faced off against Junior Lone Star FC. The annual competition open to amateur and professional teams throughout the United States, brought a thrill and excitement to Carey Stadium as the Nor’easters saw their first action of the year. Coaches are invited to Ocean City to enjoy high-quality soccer, network at "America's Greatest Family Resort"
The Ocean City Nor’easters are expanding the club’s reach throughout the state of New Jersey and beyond by inviting local coaches to the Jersey Shore to experience one of the country’s best soccer teams. For the upcoming 2018 season, the Nor’easters organization is offering any youth, high school or college soccer coaches a free season ticket package for all home games at Carey Stadium in Ocean City. The Ocean City Nor'easters are proud to announce that two of Major League Soccer's original franchises will send their top academy teams to Carey Stadium for exhibition games this summer. 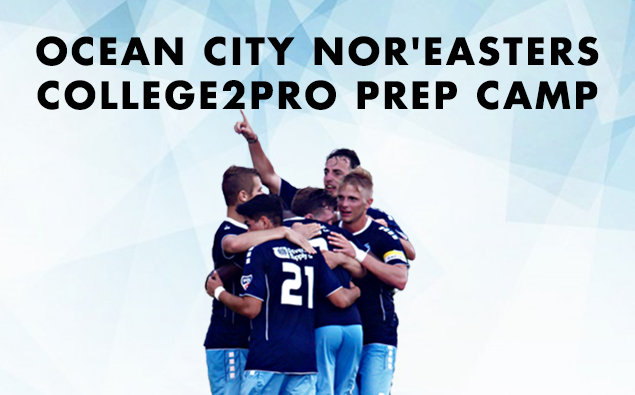 With less than two months left before the 2017 Premier Development League season kicks off, the defending Eastern Conference champion Ocean City Nor'easters are looking for a few good men. After officially agreeing to become the seventh head coach in Ocean City Nor'easters, John Thompson poses for a photo at the club headquarters in Ocean City, N.J.
For just the second time in club history, an Ocean City Nor'easters player has won the Premier Development League's Most Valuable Player award. One of the USL's longest rivalries is renewed in tonight as Ocean City faces Reading United live on YouTube at 7 p.m.
Chevy Walsh's record-breaking 16th goal of the season and Mike Kirk's heroics in goal send Nor'easters to the Eastern Conference Final. Reading United will be providing a live stream of both Semifinals on YouTube beginning at 5 p.m.
With his 13th goal of the season, Chevy Walsh is tied for the league lead in goals and breaks Ruben Mingo's Ocean City club record set back in 2004. Ocean City, New Jersey will be the scene for fireworks as the Ocean City Nor’easters play two games this weekend to give fans more reason to celebrate this Independence Day weekend. 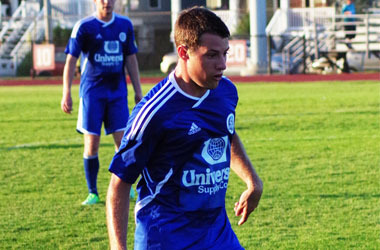 Chevy Walsh becomes the first player in Ocean City's PDL history to score two hat tricks in one season. Looking to come off two PDL losses in a row, the Ocean City Nor’easters looked to find their offense at Carey Stadium. After suffering a 2-0 loss against Reading United last weekend, the Nor'easters high-powered offense will look to get back on track. The inaugural Blue & Orange Game was a huge success! The team rosters will be announced during the Nor'easters' 2016 jersey unveiling celebration at Buffalo Wild Wings in Mays Landing, N.J..on Friday, May 13 at 7 p.m. 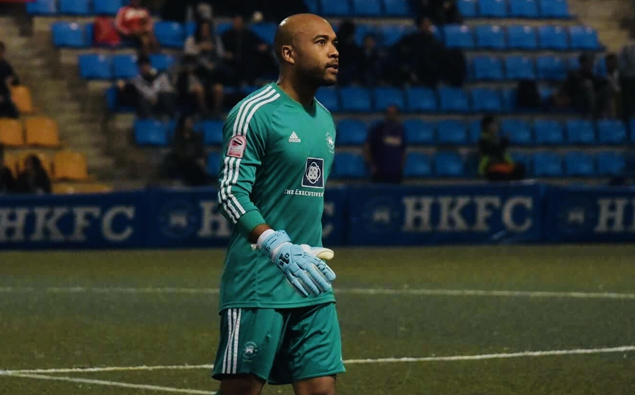 The Nor’easters have bulked up their final line of defense in acquiring a diverse group of goalkeepers for the upcoming PDL season. Ocean City returns to league play next Saturday, June 18 at Carey Stadium when they host Evergreen FC at 7 p.m.
Dean Adams, a resident of Ocean City for the past 17 years, will take the helm of the Nor’easters Promotions & Development team, and carry-on the Ocean City Nor’easters community-centric tradition. Goalkeepers Tyler Miller and Keasel Broome, and defenders Jordan Murrell and Shawn McLaws picked by MLS clubs. Michael O’Keeffe, the most successful player to take the Carey Stadium pitch in recent years, prepares to face Qatar on January 5th. Which mascot will reign supreme and be awarded the golden ball? The PDL has awarded two more Nor’easters a spot on this week’s Team of the Week Honorable Mention list; Jason Plumhoff, and Frank Tweneboa. On a muggy evening in Baltimore, The Storm ended the Boh’s five-game unbeaten streak, thanks to Plumhoff’s goal and defensive heroics from goalie Eric Klenofsky. The Nor’easters went toe to toe with undefeated Reading United on the road but failed to earn a positive result on Friday night, despite a valiant team effort. Plumhoff, captain McLaws and Z. Dennis all recognized by the league for performances against Northern Virginia and NJ LUSO Parma. With the MLS Season fast-approaching we take a look at how our Alumni in the pro-ranks are progressing. 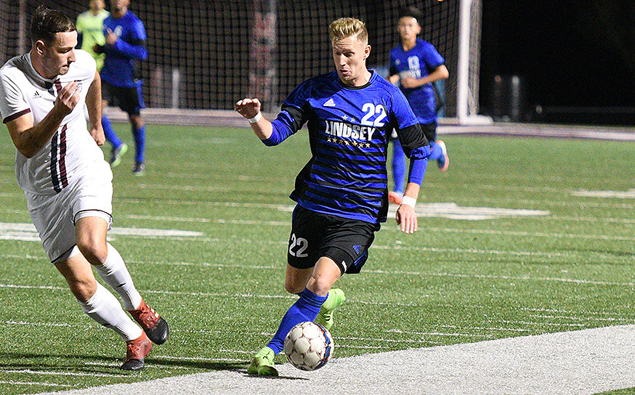 After the players spent a day working with some of the top coaches in the country on Friday, the USL Pro combine concluded this weekend with series of scrimmages between the newly assembled teams. A team featuring players and staff to take on OC Locals. After one of the most succesful years in the club’s history we take a look back at the 11 biggest highlights of the season...as 10 just wasn’t enough! Looking back on the season with Eastern Conference winning Coach Tim Oswald. With the season drawing to a close Coach Oswald took some time out to reflect upon some of the key issues which defined one of the most succesful periods in Ocean City History. The Ocean City Nor’easters must get past the Austin Aztex in Texas in the 100 degree heat if they have a chance to reach the final. As part of the Know Your Opponent series we now profile Victoria Highlanders FC who the Nor’easters could meet in the Final. Thunder Bay Chill line up against Canadian counterparts in the other semi-final. The Ocean City Nor’easters could face them in Sunday’s final. The Ocean City Nor’easters are hosting Reading United in a fierce top of the division clash that will have Carey Stadium rocking come the 7pm kick off on Sunday July 14. Another beautiful day in Ocean City, NJ greeted the Nor’easters as they played and beat the New Jersey Rangers at Carey Stadium for the second game in four days, this time the final score was 4-0. 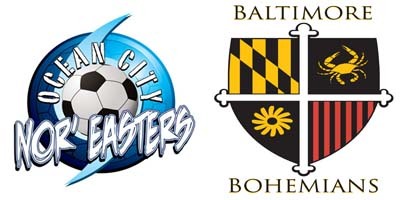 It was a beautiful evening for soccer at Loyola University that saw the Ocean City Nor’easters beat their hosts Baltimore Bohemians 3-1 to top the Mid-Atlantic Division, for at least 24 hours. In a match of two potential playoff contenders, we spoke all week about the importance of this game and earning points on the road. What Do Ocean City Nor'easters & Philadelphia Union Have In Common? 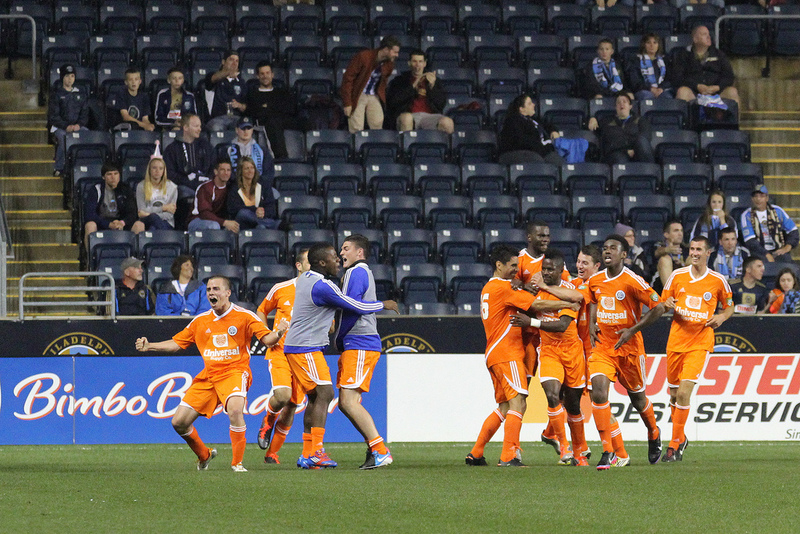 Ocean City Nor’easters just had one of the most memorable evenings in their history as they defeated the USL Pro Pittsburgh Riverhounds 1-0 in the 2nd round of the US Open Cup.